Posted on December 5, 2016 by Worth Stopping By . . . I seem to have hit on a rich vein of fantastic recipes of late. This loaded egg salad is the bomb! It requires a good number of ingredients — luckily I had everything that I needed on hand. Layers and layers of flavor create a really satisfying mouthful. Serve it as a salad on lettuce or in a sandwich. You can’t go wrong with this recipe. Place the bacon in a large skillet and cook over medium-high heat, turning occasionally, until crispy, about 10 minutes. Drain the bacon slices on paper towels and crumble once cooled. Mix bacon, celery, mayonnaise, onion, relish, mustard, chile-garlic sauce, dill, Worcestershire, black pepper, paprika, and salt together in a large bowl; add eggs. Break egg whites and yolks with a potato masher into the bacon mixture. Stir broken egg pieces into the salad. Cover bowl with plastic wrap and refrigerate at least 1 hour. Posted on April 2, 2016 by Worth Stopping By . . .
Well, I finally decided to give this recipe a try. We’ve all seen it on the internet — ham and Swiss sliders covered with mustard and poppy seed. I took some of my leftover Easter ham and gave it a go. Really good . . . Surprisingly good!! I took a package of Hawaiian rolls and layered on the ham and cheese. Then, the magic happens — melted butter, minced onion, yellow mustard and poppy seed are combined and slathered across the top before you pop these in the over for about 15 minutes. It is the butter combined with the savory flavors of the other ingredients that really puts this over the top. Great for parties . . . football watching . . . quick supper with the family . . . And don’t wait for a special occasion – deli ham would work just as well. Enjoy! Preheat oven to 350°Slice dinner rolls in half horizontally. Cut or tear pieces of ham to fit rolls. Same with the Swiss cheese – create 12 slices. In a small bowl, mix together mayonnaise and Miracle Whip. Spread mixture onto both sides of each roll. Brush or pour the sauce evenly over all of the rolls; don’t feel like you have to use all of it, especially if you’re only making 12. Let rolls sit for at least 10 minutes so sauce sets. Cover with foil, avoid touching top of rolls if possible, and bake at 350° for 12-15 minutes, or until cheese is melted. Remove foil and cook for an additional 2 minutes to make tops are slightly brown and crispy, if desired. Serve warm. Posted on November 30, 2015 by Worth Stopping By . . .
It’s time for one of my favorite after-Thanksgiving recipes. This Turkey, Cranberry and Dressing Panini is easy to make and uses all of your favorite Thanksgiving leftovers. Just take a few slices of turkey, some dressing (stuffing), cold gravy, and cranberry sauce stacked on some hearty bread and grill it into a golden brown piece of heaven. You don’t even have to heat up the ingredients before hand — they all cook up together in the pan. This panini is like a mini-holiday feast in your mouth. We upped the ante here by using Pumpkin Bread. Yum! Spread one slice of bread with a thin layer of cold gravy. Layer the sandwich with slices of turkey, dressing, and more gravy. Season with salt and pepper and top with sage. Spread a thick layer of cranberry sauce on the other slice of bread. Butter each side of the sandwich. Toast in cast iron skillet until brown and crisp on both sides. Posted on November 19, 2015 by Worth Stopping By . . .
Folks in the South L-O-V-E their biscuits. Sadly, this is something that escapes me entirely (such blasphemy!). I have only made biscuits a handful of times in my life, but this recipe inspired me to try, try again. I saved a bit of mashed sweet potatoes from our Maple-Pecan Sweet Potato Mash the other night to add flavor and serve as a natural sweetener. Remember that when handling bread and pastry the rule is always ‘Less is More’. You should cut in the butter and shortening until the pieces are about the size of a pebbles. If you work the mixture too much the biscuits will become dense and lose their light, fluffy texture. Make sure that you turn the dough out onto a lightly floured surface. Too much flour will cause the dough to become too dry, and your biscuits will crumble and break apart. These biscuits come out a beautiful golden color with a delicious, slightly sweet flavor — a perfect compliment for country ham, homemade jelly or maybe just a drizzle of honey. 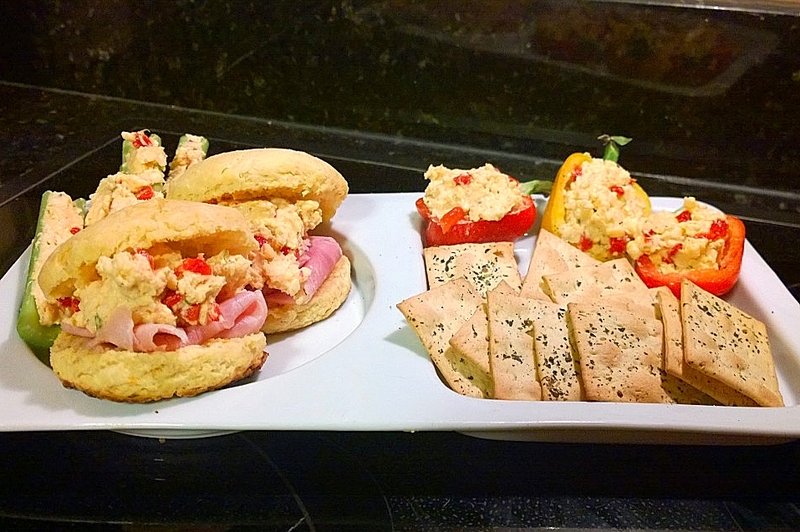 Served here with ham and Pimento Cheese. Stir together first 3 ingredients in a large bowl. Cut butter cubes and shortening into flour mixture with pastry blender or fork just until mixture resembles coarse meal. Cover and chill 10 minutes. Whisk together buttermilk and sweet potato. Add to flour mixture, stirring just until dry ingredients are moistened. Turn dough out onto a well floured surface, and knead lightly 3 or 4 times. Pat or roll dough to 3/4-inch thickness; cut with a 2-inch round cutter, reshaping scraps once. (Do not twist cutter.) Place rounds on a parchment paper-lined baking sheet. Bake at 425° for 18 to 20 minutes or until biscuits are golden brown. Remove from oven, and brush tops of biscuits with melted butter. Serve immediately. Posted on October 3, 2015 by Worth Stopping By . . . This recipe put me in “left-over” heaven! It just so happened that I had two pieces of baked chicken, a quarter of a red onion and a half of a lime waiting to be used in my refrigerator. All I needed was a nice, fresh avocado and I was good to go! A beautiful, fresh take on chicken salad — served here on toasted pumpkin bread. Blend the avocado and the lime juice until smooth. Mix in the cilantro,the onion, and season with salt & pepper. Fold the shredded chicken into the avocado mixture and serve. Posted on September 9, 2015 by Worth Stopping By . . . I found some really beautiful avocados this week and wanted to try them in a grilled sandwich for a change of pace. I followed the instructions laid out by Serious Eats but I do have a couple of suggestions. I microwave my bacon for crispness, and I prefer to use a multi-grain bread for added nutrition and a cheddar rather than processed American cheese . The major change that I would make is to forego using bacon grease to grill the sandwich. It adds a heavy, greasy taste and adds unnecessary fat and calories to the product. I usually butter the bread slices before I add them to the pan and turn the sandwich all at once rather than assembling it mid-way through. However, the method listed below does toast each slice of bread on both sides. This sandwich will be delicious and satisfying whatever method you choose. Yum! Place bacon in a large nonstick or cast iron skillet and cook over medium-low heat, turning occasionally, until crisp all over, about 8 minutes. Transfer bacon to a paper towel-lined plate and bacon fat to a small bowl. Once the pot is at a full boil, throw in a half-cup of your favorite hot sauce. Transfer to a cutting board toasted-side-up. 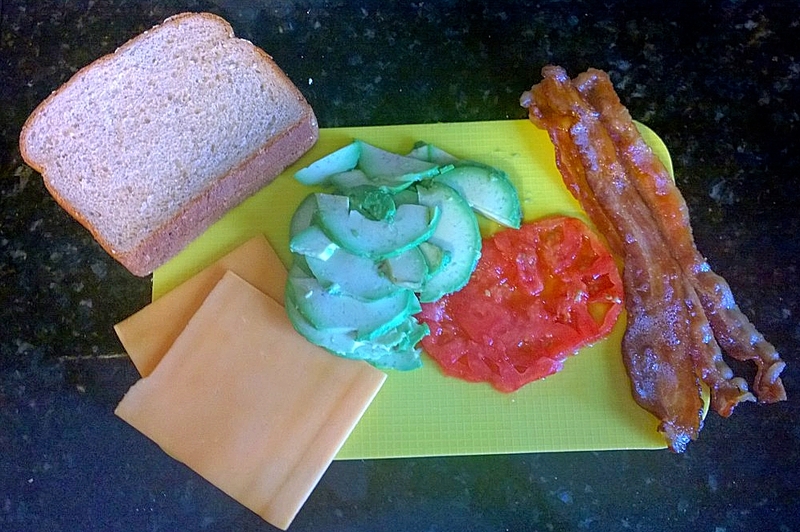 Place one cheese slice on top of one slice, followed by bacon, tomato, and avocado. Top with second cheese slice and close sandwich.